Wall painting can dramatically change the look and feel of a room. If you’ve ever stood in a kitchen with bright yellow walls and felt a mysterious mood change, you’ll understand! But not everyone responds to color schemes the same way. A certain shade of yellow may be agitating to one person, whereas the same shade might bring others pure joy! All The Walls can help you achieve visual harmony with their superior painters and color design services. But how do we discover which color combinations have a positive impact on our mood? What about how they compliment our furniture? Fortunately, color designers are experts at taking these factors into consideration. A discerning eye and careful consideration of existing features aids in the process. These professionals are available to help you turn a room from unremarkable to brilliant in no time! Have stacks upon stacks of color paint swatches but can’t quite visualize the final product. Are feeling tentative about committing to certain colors. Want to keep your home period-correct and need help finding the right historic colors. Have a blank slate in front of you and are totally intimidated! Why paint color is important in the design of Your Vancouver home. Color design isn’t limited to the interior paint, it can also help in coming up with exterior color painting ideas. The trim and siding colors need to compliment each other in order to achieve the best visual effect. Because of the scale and effect on curb appeal, it’s not always easy deciding on exterior house paint colors. Doing a bit of research and perhaps taking a walk around a nice neighborhood will give you an idea of which colors feel right to you. Give us a call when you’re ready. We will provide a realistic assessment of your project depending on your budget and expectations. We also offer consultation services with no requirement to begin painting work. Choosing the Best Color Design Elements is Our Speciality! Figuring out which colors make you happy is just the beginning. All The Walls owner Jean Santee is an expert in color theory and consulting. She does color-matching and takes existing architectural elements into consideration for every project. For maximum impact, she evaluates these unique characteristics and works with you to come up with the best color design plans. A complete assessment of work to be done. A written proposal with cost estimates. Flexible scheduling that meets your needs. Consistency in service and respect for your property. Protection for your belongings during the painting process. Responsible, thorough clean-up after the work is completed. Jean has a versatile background in color design and a unique chemistry with her clients. She knows that color consulting is a collaborative effort. She listens and observes, suggesting options that make the most sense for each project. By looking at color palettes and other helpful visual tools, she can help narrow down the best choices for your kitchen, bathroom, gathering space, or bedroom colors. 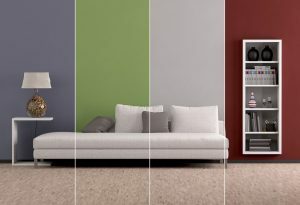 Call us today for professional paint color consulting!